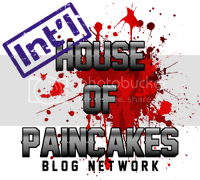 So here is the deal - Team North America - One of the painting groups I belong to has decided to do something a little special to give back to the greater community this year. 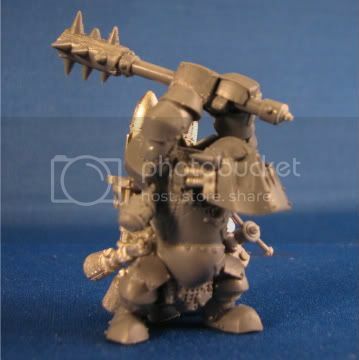 A large number of us have decided to each build and paint an Ork Nob to create the most unbelievable Ork Nobz squad ever! Nobz by myself, Chris Borer, Dave Taylor, Tim Kholmetz, Nathan Comanse, Shawn Welte, Dave Pauwels, Joe Orteza, Todd swanson, Dylan Gauker, Jeff Wilhelm and a whole pile of others will be auctioned or sold (still determining the mechanics of this) as a unit to raise money for a childrens charity! Things are never that easy with TNA, however, as there has to be some additional twist to keep it a challenge for all involved! In this case it is a time limit. hours of work time start to finish - includes prepping the model, building, conversions, sculpts, painting and finishing!!!!!! Orteza rarely preps a model in this time frame and I genuinely dont think Borer has basecoated a model in 8 hours before! So it is going to be a real kick to see us all pull out our best tricks and tips to produce display quality minis in record time - heck Dave Taylor is so confident he is even entering his in the Golden Demons!!!! Pieces from our squad will be displayed at Games Day Toronto, Baltimore and Games Day Chicago as well as being displayed on the internet - so if you are at any of these events come and ask us to see what its all about. 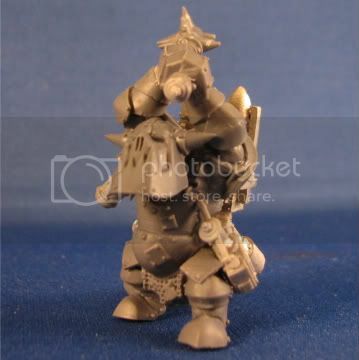 So here you go - a first peek at the Ork I am working on. 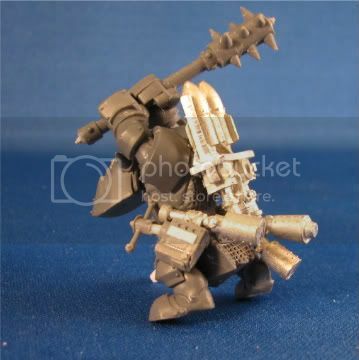 This is based on a WFB black ork model but built out to be the squad demolition expert - heavily armed with explosive power! Plenty of stikk bombz, a missile pack and a giant spiked stikk bomb on a pole/mace. There will even be a personal bomb squig incorporated into the base! 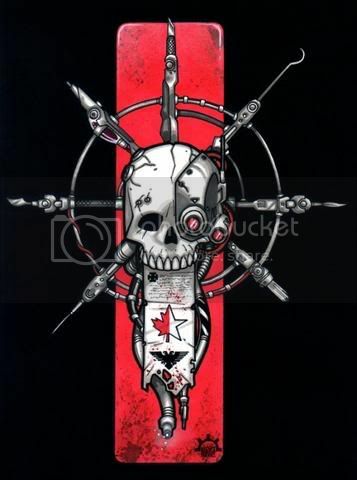 I am especially pleased with the plunger detonator attatched to his belt - I have always been a fan of these things when Wile E. Coyote or Bugs would use them in Looney Toons cartoons and have long wanted one in 40k - Finally an excuse to make it!!!!! The figure will be mounted (as will all the pieces) on a "Wasteland II" base cast by Jeff Wilhelm of Dragonforge. I have picked out the one I want and am eagerly awaiting its arrival. Cya next week for the first painting update!